Asics Noosa FF are neutral performance running shoes. The eye candy Asics Noosa FF adds latest technology from japanese brand using FlyteFoam™ in midsole only seen so far in more or less experimental running shoes like DynaFlyte or premium ones like Nimbus 19. Current edition is the 12th of the popular Noosa saga but big marketing campaign promoting FlyteFoam™ removes numbering to focus on new compound with FF in official name. One of the most unexpected facts about Asics Gel Noosa running shoes is its success as casual sneakers based on its original and jazzy upper design but current Noosa FF gets rid of famous Tiger stripes and uses a star based design with fused overlays. Typically Noosa running shoes have focused on medium/long distance triathletes and in addition to seamless upper ideal for sockless running, both tongue and collar support better to quickly remove and put wet feet. 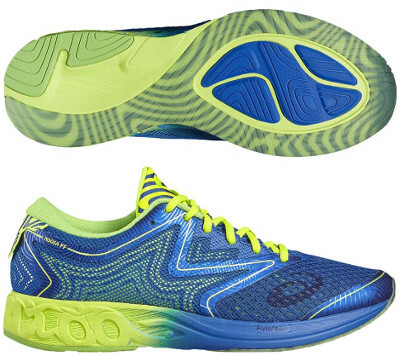 Major change from its predecessor Gel Noosa Tri 11 is the FlyteFoam™ midsole for reliable cushioning and great response. To strength the link between Noosa and triathlon, brand name and all sports involved (swimming, cycling and running) are carved in midsole's wall in a very cool way. Outsole also changes its configuration moving away from classical way and embraces a more open concept featuring an improved grip on wet surfaces with AHAR rubber placed in most exposed areas for longer durability.